Mugsy is a black kitty cat that scared away an alligator. He was protecting his family even though they were too stupid to get away from, you know, an alligator! Here's a link to the post I wrote about him. 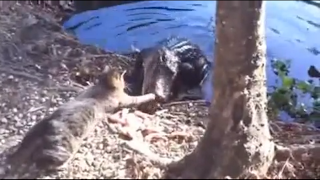 It's got lots of video of badass cats and men fighting alligators. Mugsy's the only one who won the fight, but the men walked away even if it looked pretty bad on video. Ceiling Cat is black. Ceiling cat scares away evil alligators. Here's another video of I think the same cat. Here he is defending a chicken. Well, chicken parts. Isn't that sweet? Go ahead and eat the chicken, little Mugsy. She's beyond saving at this point. This alligator is kind of a wimp. 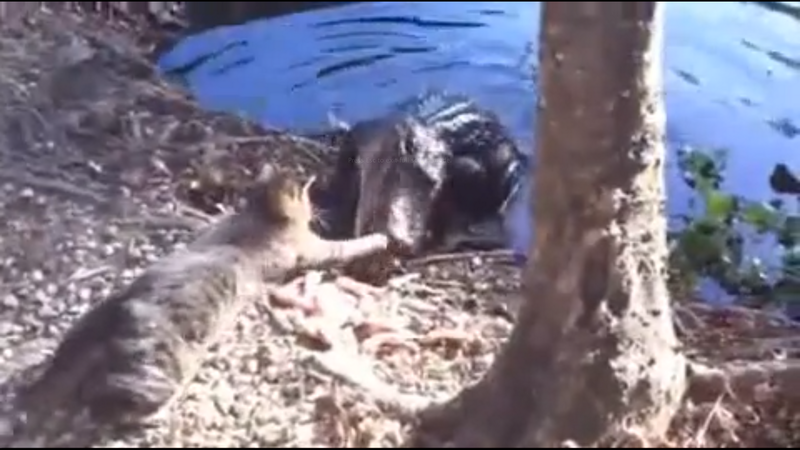 Click here to see Mugsy take on two alligators.